When you download audio from the Internet it is probable that you will find some albums that have been ripped into a single file, DJ sessions and radio programs, and you will only require a part of the file, so you will need to use an audio editor or if you don't have one, a tool like mp3Extractor. This simple application has a very simple interface from which it will be possible to cut any sound file into various parts, and export them so that they can be played independently. When you extract the audio with the program, it will automatically number each piece of the file. 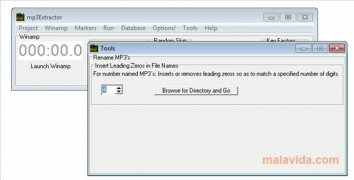 The program has various functions by means of which you will be able to join various audio files into a single one, offering the possibility to join all the songs from a folder into a single file, for example. 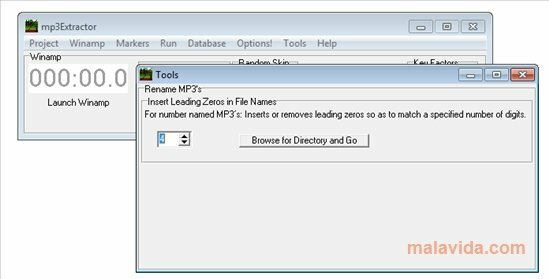 Discover the quickest way to detach your favorite songs from a recorded radio program or a DJ session thanks to mp3Extractor. This application requires the prior installation of Winamp 2.x or Winamp 5.x. This download requires a ZIP compatible compressor.